This is an image of the area around the city of Angkor, Cambodia. The city houses an ancient complex of more than 60 temples dating back to the 9th century. The principal complex, Angkor Wat, is the bright square just left of the center of the image. 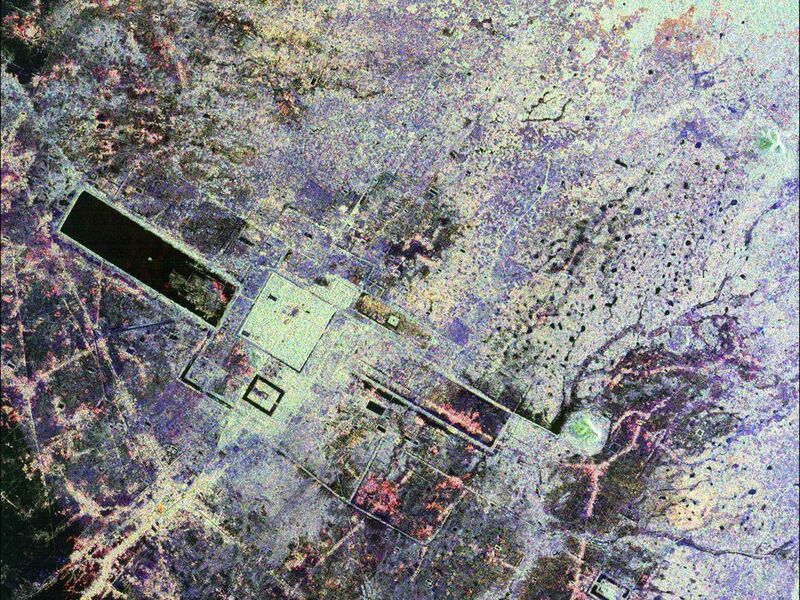 It is surrounded by a reservoir that appears in this image as a thick black line. The larger bright square above Angkor Wat is another temple complex called Angkor Thom. Archeologists studying this image believe the blue-purple area slightly north of Angkor Thom may be previously undiscovered structures. In the lower right is a bright rectangle surrounded by a dark reservoir, which houses the temple complex Chau Srei Vibol. In its heyday, Angkor had a population of 1 million residents and was the spiritual center for the Khmer people until it was abandoned in the 15th century. The image was acquired by the Spaceborne Imaging Radar-C/X-band Synthetic Aperture Radar (SIR-C/X-SAR) on the 15th orbit of the space shuttle Endeavour on September 30, 1994. The image shows an area approximately 55 kilometers by 85 kilometers (34 miles by 53 miles) that is centered at 13.43 degrees north latitude and 103.9 degrees east longitude. The colors in this image were obtained using the following radar channels: red represents the L-band (horizontally transmitted and received); green represents the L-band (horizontally transmitted and vertically received); blue represents the C-band (horizontally transmitted and vertically received). The body of water in the south-southwest corner is Tonle Sap, Cambodia's great central lake. 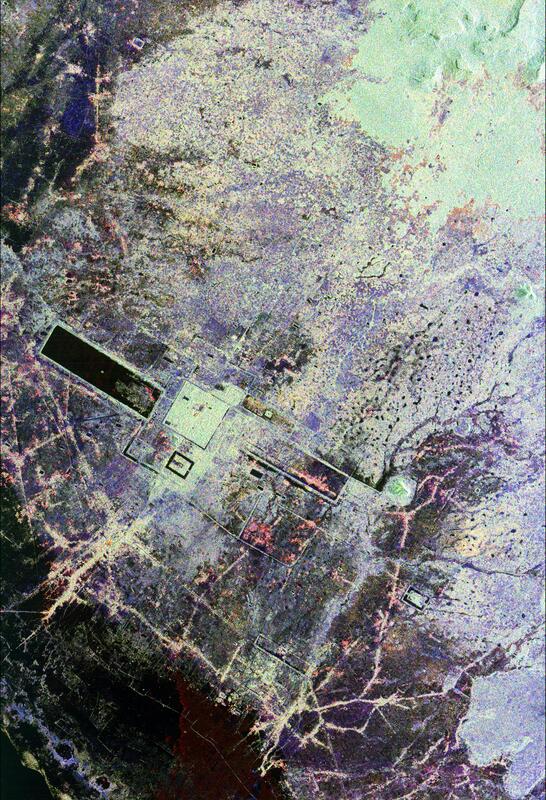 The urban area at the lower left of the image is the present-day town of Siem Reap. The adjoining lines are both modern and ancient roads and the remains of Angkor's vast canal system that was used for both irrigation and transportation. The large black rectangles are ancient reservoirs. Today the Angkor complex is hidden beneath a dense rainforest canopy, making it difficult for researchers on the ground to study the ancient city. 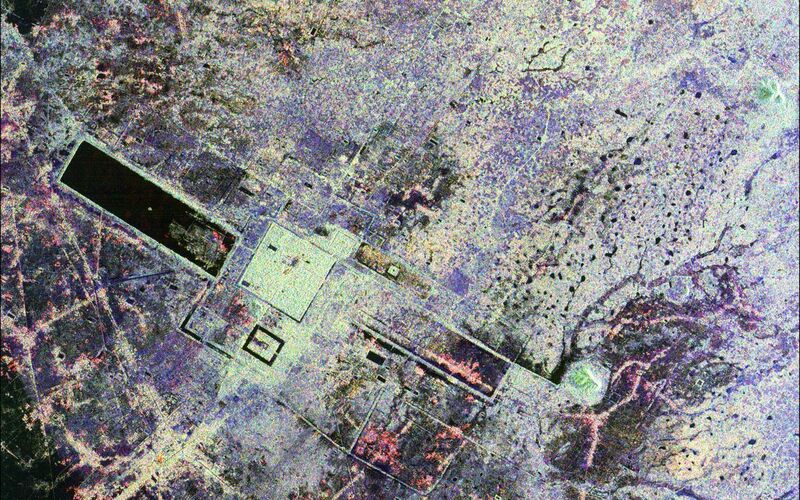 The SIR-C/X-SAR data are being used by archaeologists at the World Monuments Fund and the Royal Angkor Foundation to understand how the city grew, flourished and later fell into disuse over an 800-year period. The data are also being used to help reconstruct the vast system of hydrological works, canals and reservoirs, which have gone out of use over time. Research teams from more than 11 countries will be using this data to study the Angkor complex. Spaceborne Imaging Radar-C and X-Synthetic Aperture Radar (SIR-C/X-SAR) is part of NASA's Mission to Planet Earth. The radars illuminate Earth with microwaves allowing detailed observations at any time, regardless of weather or sunlight conditions. SIR-C/X-SAR uses three microwave wavelengths: L-band (24 cm), C-band (6 cm) and X-band (3 cm). The multi-frequency data will be used by the international scientific community to better understand the global environment and how it is changing. The SIR-C/X-SAR data, complemented by aircraft and ground studies, will give scientists clearer insights into those environmental changes which are caused by nature and those changes which are induced by human activity. SIR-C was developed by NASA's Jet Propulsion Laboratory. X-SAR was developed by the Dornier and Alenia Spazio companies for the German space agency, Deutsche Agentur fuer Raumfahrtangelegenheiten (DARA), and the Italian space agency, Agenzia Spaziale Italiana (ASI).